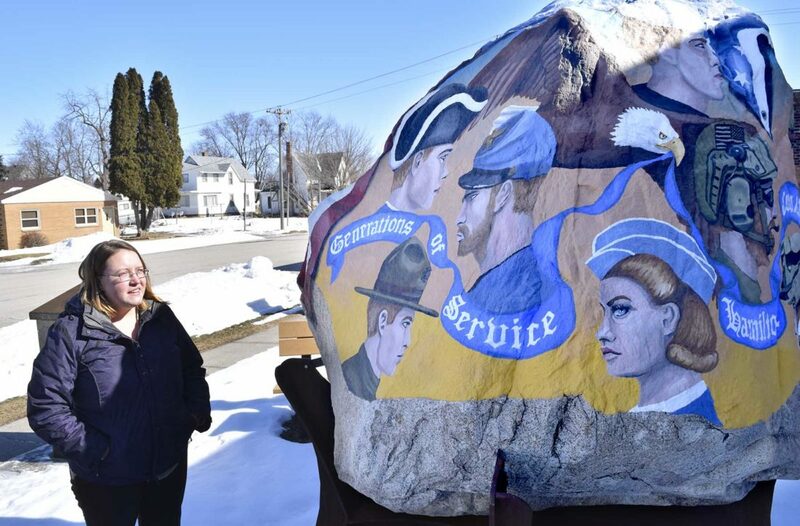 -Messenger photo by Joe Sutter Stratford City Manager Amanda Westrum explains the scenes on the Hamilton County Freedom Rock, just down the street from the city office. The art was completed in late fall shortly after Westrum started her job. 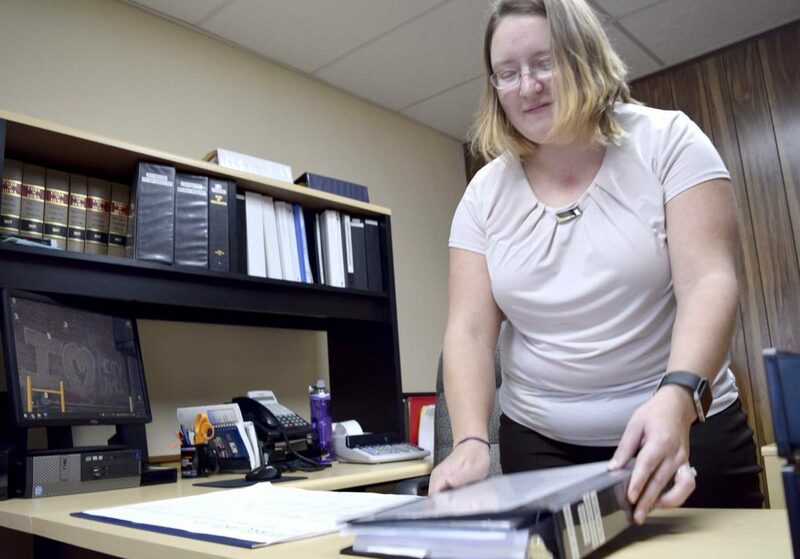 -Messenger photo by Joe Sutter Amanda Westrum gets to work at her office at the Stratford City Hall, with Iowa Code books and binders full of meeting minutes and information on the shelf behind her. Westrum said not everyone realizes how much research and work goes in behind the scenes to make local government function. STRATFORD — Just before Stratford’s new city manager started work in the office, she set off on a honeymoon cruise. A few days later, the ship had come back to port early, and the couple had to rent a car and join the bumper-to-bumper gridlock flowing out of Florida to escape Hurricane Irma. “It was a little scary,” Amanda Westrum said. Today, Westrum is enjoying her job, performing the behind-the-scenes work that keeps her town running. But she’s been asked many times to tell about the hurricane. So far she hasn’t gotten tired of it. Amanda and Adam Westrum knew there was a possibility of hurricanes before they set out for Florida, but thought things might work out. “Well, they haven’t canceled the cruise, so we’ll just go. And hopefully things will work out for the best,” Amanda Westrum said. When they arrived, they learned the hurricane had caused the cruise to re-route. A few days later, they learned the boat would be turning around. “They weren’t going to Mexico, weren’t going to Disney’s private island or anything like that. They were just going back to Florida, and advised everyone to get out of Florida as fast as they could,” Westrum said. Since they had planned on staying in Florida a few days after the trip, their flight wasn’t canceled, so they had difficulty getting a replacement, Westrum said. It would have been almost impossible to find a flight, so they decided to rent a car and drive back to Iowa. The ship took a day and a half to get back to port, she said. Then there was a rush to get through customs, and the couple set off for southern Florida, the only place they’d been able to find a car available. “Then we had to drive back through, and we drove 18 hours that first day, to my cousin’s house in South Carolina,” Westrum said. “I believe it would have normally taken us about seven hours. Westrum and her husband both grew up around the area — Adam in Stratford, and Amanda out in the county between Webster City and Fort Dodge. After graduating from college and starting her job search, Amanda Westrum saw Stratford’s job posting on Facebook and applied. Westrum went to school in Webster City, and then graduated from the University of Northern Iowa with a degree in communication. This job is what she was looking for. Every day is different, Westrum said. Sometimes she’s working on budgets; sometimes her focus is on utilities; some days she’s planning for the future. She’s also taken an interest in the city’s Main Street Iowa designation. Westrum is also part of the Hamilton County Economic Development board. “This is where we both wanted to be,” she said. “I’ve got a 5-year-old daughter that goes to school in Webster City. I didn’t really want to pull her out of school. Even the hurricane honeymoon worked out well. The Westrums listened to a whole book on Audible on their way home from Florida, and enjoyed the time together. “It was the quintessential car trip,” she said. And in spite of the high-stress situation, “We never fought. I think that’s a good sign for our relationship.